Warning: this may sound crazy at first. But hear me out, listen to my anecdotal evidence* and then try it out for yourself. Nurses are excellent at placing peripheral IVs. Occasionally, some patients are too tough and the nurses turn to us. Not because we're any better -- they place plenty more IVs than we do -- but because we can use sites they aren't allowed to (EJ), perform invasive procedures (CVC & IO), and have tools they usually aren't allowed to use (ultrasound -- great video from the US guys!). These are all methods that work, but take time, and sometimes the US-guided peripheral just won't take. Sometimes the nurses get the line (hurray!) but couldn't get the labs (oh no!) -- which is frustrating (or at least, it used to be). The recourse I see a lot of people take is the arterial stick, invariably a blind radial draw. Seems reasonable -- you can feel the pulse, it only takes a few minutes, and is successful ~80% of the time. ** If you're savvy at US then it's even more likely to be successful. But I have seen many a tiny and/or squirrelly radial artery, and those do not like being poked. This may sound drastic. I used to reserve it for sick patients -- those critically ill enough to have pharmacologic or endogenous sedation, or at least those who seemed sick enough to warrant it. But mission creep set in, and now I will do it on nearly anyone who needs blood drawn but not a catheter. This may seem extreme, particularly when the radial is an option. But in my head, this takes a 5 minute procedure with an 80% chance of success into a 30 second procedure with a 100% chance of success. In the words of Dogbert, it's like sandblasting a soup cracker. I tell the patient that it may sound crazy, but that I really think this will be better than digging around in their arm for 5 minutes -- which they invariably just went through about 3-10 times before the nurse called me over. Of course this is anecdotal, but when I ask (awake) patients if this was better or worse than a other sticks (i.e. peripheral IV placement or blood draw) they invariably say the groin was MUCH less painful. There was one even one awake guy with a fully functioning brain and nervous system where we had a conversation through the entire fem draw, and he didn't feel a thing. Nothing! He didn't believe I had even poked him until I showed him the 20 mL syringe full of his blood. I've started telling patients that while it may seem scary and will hurt a bit because, well, it's still a needle, but that enough patients have told me it's better than the arm pokes that I feel comfortable telling them it's less painful than any other option. And afterward, every awake patient has agreed. Some of you may have noticed that I have yet to specify femoral vein or artery. That's not an accident. If it's a sick patient, I want blood and I don't care where it comes from. Vein is probably preferable to artery -- less chance of complication such as fistula or pseudoaneurysm, and just for convenience, less time holding pressure when you're done. I've also had a markedly lower rate of hemolysis than I expected. In fact, if I have a sick patient and they look like they will be a difficult IV placement at all, I routinely advise my nurses NOT to try to get labs at all -- just focus on getting the IV and I'll take care of the labs. Makes for happy patient, happy nurses, happy doc, happy blood. 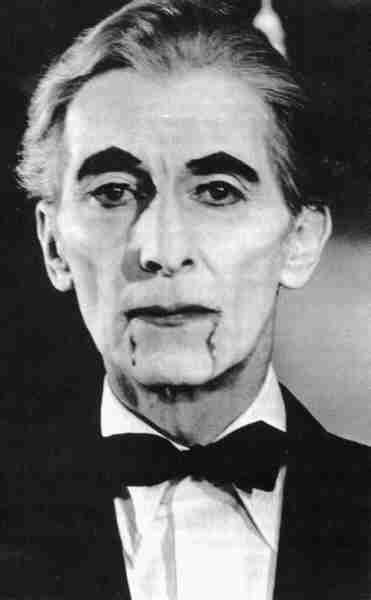 Image: Peter Cushing as Dracula. Before blowing up Alderaan as Grand Moff Tarkin, he was a B-movie vampire. @thetopend @mdaware what, as opposed to Fast Functional Femoral (the lesser known #FFF) ?? Femoral artery is my last resort because it looks scary for the patient. It's very easy actually, success rate is almost 100%, and we do it blindly. We don't have any ultrasound machine. Just make sure the site is sterile. If the patient is awake, I explain to them that it sounds scary, but that it's much better than the last 20 minutes the nurses spent digging around in their arm!